"In a civil justice system where you're five times more likely to prevail with representation than without it, access to justice requires access to quality legal services," said Assistant U.S. Attorney General Tony West in his commencement address at the University of California Hastings College of the Law on May 16. West's address was in large part a call to service for the graduates, who were reminded that a legal education "brings with it great responsibility: to reach out beyond the boundaries of our own comfort and security and to lead in ways both big and small." "Because when budgets tighten, and courthouse doors close," said West, "the need for legal services among poor people, immigrant communities and people of color, working families and small businesses trying to make it-that need grows." He noted that at the federal level, the Obama Administration has taken steps to close the justice gap by seeking increased funding for the Legal Services Corporation, and the Department of Justice has launched an Access to Justice Initiative to create a permanent effort to increase access to counsel for the poor. West also spoke at a May 20 awards ceremony hosted by a fundraising group that supports the LSC-funded Legal Aid Bureau of Maryland. "You provide this community with needed legal services, you secure access to justice by facilitating access to our courts, you provide hope to many who have lost it," said West. Click here to learn more. West is in charge of the Justice Department's Civil Division, which represents the U.S. in civil and criminal matters within its scope of responsibility, which includes protecting the Treasury and preserving the intent of Congress. Click here to read the full text of West's address. LSC and the Center for Legal Aid Education (CLAE) cosponsored a training session for board members of LSC-funded programs on May 12, 2010, in Phoenix, Ariz., prior to the Equal Justice Conference. Karen J. Sarjeant, LSC Vice President for Programs and Compliance, opened the event with a discussion of the critical importance of a strong, effective and involved board of directors and LSC's desire to support effective board and organizational practices. The training, entitled "Board Development: The Legal Aid Context," focused on the various roles and responsibilities of boards as well as those of individual members, the role of staff, areas which require strong board/staff partnerships and a board's role in ensuring effective financial and regulatory oversight. Board members and executive directors from LSC-funded programs in 13 states attended the training session, which was led by Ellen Hemley, executive director of CLAE, Chuck Greenfield, Program Counsel at LSC, and Gerry Singsen, a consultant and trainer for legal aid programs. Other LSC staff were also in attendance. LSC staff helped lead a number of sessions at the Equal Justice Conference, which was held in Phoenix from May 13-15. LSC President Victor M. Fortuno and Ms. Sarjeant led a session on hot topics in legal aid, where they discussed Congressional efforts to reauthorize LSC, the Corporation's funding outlook for the next fiscal year, the status of the transition of LSC's Board of Directors and other issues. Other sessions led by LSC staff focused on issues relating to pro bono, technology, client intake and natural disasters. Click here for more information on the conference, including a link to the full agenda. Two new academic studies on medical-legal partnerships contain findings that support the core premise underlying these innovative collaborations: medical problems often have legal solutions. The first study, conducted by a research group connected with George Washington University and released on May 4, found that between 50 and 85 percent of patients at community health centers experience unmet legal needs that often negatively impact health and that medical-legal partnerships are an effective means of addressing these problems. Click here for more information and a link to the full report. LSC-funded legal aid programs participate in more than half of all medical-legal partnerships in the country, according to the National Center for Medical Legal Partnership. Click here to learn more. Edna Fairbanks-Williams, appointed to the Board of Directors of the Legal Services Corporation by President Clinton, died in a car crash May 10 in Castleton, Vermont. She was 77. 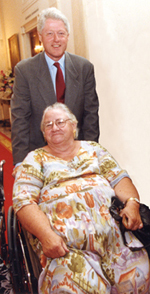 Ms. Fairbanks-Williams served on the LSC Board from 1995 to 2004. For 40 years, she was a leading advocate for the poor in Vermont. According to the Rutland Herald, Ms. Fairbanks-Williams spent her most recent days making dawn-to-dusk deliveries of free food and clothing to needy neighbors and visiting the Vermont legislature to oppose proposed social services funding reductions. "Edna brought a real world perspective to LSC as a client-eligible member. She was a strong voice on behalf of low-income Americans, the elderly and persons with disabilities, and she will be greatly missed," LSC President Victor M. Fortuno said. Ms. Fairbank-Williams helped launch the Vermont Low Income Advocacy Council and was a longtime board member of Vermont Legal Aid, the Legal Services Law Line of Vermont and the nonprofit Vermont Dental Care Programs for low-income children. She also had served as an adviser to the Vermont Governor's Commission on Women. Fifty-thousand dollars for a new library, thousands of new books for an annual book fair, Thanksgiving dinners for poor families, sponsorship of class trips. Those are just some of the things that the Chicago office of Sidley Austin LLP has done for the Gerald Delgado Kanoon Magnet Elementary School during their 25-year relationship, which was highlighted in a May 13 article in the Chicago Law Bulletin. John G. Levi, chairman of LSC's Board of Directors and a Sidley Austin partner, said about the partnership, "We're one of the oldest law firms in the city of Chicago. I think this is just one way we feel as a firm community, both staff and the lawyers, we can help the city, and it's a way of giving back." The law firm was honored by the Chicago Public Schools system last October in recognition of the partnership. Click here to learn more. Legal aid programs and volunteer attorneys looking to help those affected by the recent flooding in Tennessee can find valuable resources and information on a number of websites. The National Disaster Legal Aid site, at www.disasterlegalaid.org, has a dedicated section for flood-related information, including a disaster assistance manual, a webcast from the Young Lawyers Division of the Tennessee Bar Association and links to other resources. There is also a section with general disaster-related information specifically for LSC-funded programs. The Tennessee Bar Association has posted flood-related information for volunteer attorneys, members of the public and lawyers who have been affected by the flooding on its website at www.tba.org/volunteer. The Tennessee Alliance for Legal Services is compiling information on the recovery efforts throughout the state (download the document) and has posted additional information on its site at www.tals.org. Eleven of the D.C. Bar's 21 sections have issued a public statement to the D.C. Council, calling on it to block Mayor Adrian Fenty's proposed budget cuts to legal services for the poor. Fenty's cuts would reduce the program's budget from $2.86 million in fiscal year 2010 to $1.8 million for fiscal year 2011. This year's reduction would be a further cut from the $3.6 million budget the Access to Justice Program had in 2009. It provides legal services for indigent D.C. residents, as well as a community legal interpreter bank, and a loan repayment program for lawyers serving people living in poverty. Fenty proposed similar cuts last year, but the council ended up restoring some of the money that would have been cut. The effort to block the budget cuts this year was led by the Litigation Section, which, with 3,400 members, is the bar's largest. The Litigation Section circulated the statement to all 21 of the bar's sections. Each section had a week to vote on whether to sign on. The Legal Aid Bureau of Maryland has received the lion's share-$911,000-of a $2.4 million cy pres award distributed by a county court to legal organizations throughout Maryland and in Washington, D.C. The funds are left over from a decade-old class-action lawsuit involving late fees on cell phone bills, according to a May 6 article in The Washington Post. 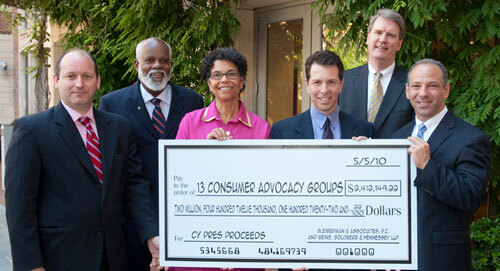 Wilhelm Joseph, executive director of the Legal Aid Bureau (second from left), with other fund recipients and lawyers for the plaintiffs of the original class-action case. Wilhelm Joseph Jr., executive director of the Legal Aid Bureau, told The Post that the money will compensate for losses in funding from Interest on Lawyers' Trust Accounts, a major source of revenue for legal aid programs. "The great pain for me was watching our money decline just as more people needed our services," said Joseph. A dedicated attorney for children with special needs will begin a one-year Fellowship at Atlanta Legal Aid Society Inc. in June funded by a grant from the Nelson Mullins Riley & Scarborough LLP law firm. Craig Goodmark currently serves as director of the TeamChild Atlanta Project at the organization. As director, Mr. Goodmark provides technical assistance, advocacy, and full legal representation to low income families whose children with disabilities are not having their developmental, educational, or mental health needs met. Mr. Goodmark has represented hundreds of students in the metropolitan Atlanta area secure appropriate educational services. Previously, Mr. Goodmark helped Nelson Mullins establish an extension of the TeamChild project, "TeamChild: Early Intervention," which focused on identifying and advocating for babies and young children with special needs as early as possible. By advocating for services earlier, Nelson Mullins' TeamChild Project sought to maximize an at-risk child's chance of staying on the right path, being successful in school, and staying out of the juvenile justice system. Mr. Goodmark has supported this project within the Firm's Atlanta office and has actively supervised the Firm's attorneys in representing dozens of children with special needs. "Craig came to us out of the blue wanting to help us and volunteer, and his background was in special education cases. He volunteered on the TeamChild project to work to keep kids with disabilities out of juvenile detention," said Steve Gottlieb, Atlanta Legal Aid Society executive director. Michael L. Monahan, director of the Pro Bono Project of the State Bar of Georgia and the Georgia Legal Services Program, has received the 2010 Tanya Neiman Pro Bono Professional of the Year Award from the National Association of Pro Bono Professionals (NAPBPro). The award is named after the former long-time director of the San Francisco Bar's pro bono program and is given to pro bono professionals who demonstrate a steadfast commitment to pro bono and have achieved outstanding results. "Mike Monahan has not only achieved all of that, but more," reads the press release from NAPBPro. "He is a resource to countless pro bono professionals across the country and his command of the electronic age and its importance to pro bono are immeasurable. As we straddle the past and future of pro bono, Mike has been a bridge not only for pro bono in Georgia, but, to all those who have attended presentations he has given or asked for his assistance. It was an honor to give this award to Mike Monahan and in a small way, thank him for his abilities and willingness to share them with all." Click here to learn more about Georgia's Pro Bono Project. Note: The following story originally appeared in the 2009 Annual Report from the Advocates for Children's Services, a project of Legal Aid of North Carolina. Click here to learn more about the project or to download the full annual report. Johnny is a twelfth grade student with Central Auditory Processing Disorder, which interferes with his ability to understand and process both oral and written information. Federal law requires that schools modify and adapt their instruction so that Johnny is able to make educational progress. Johnny did well in elementary school and received the special education services that federal law requires. However, Johnny's middle school unilaterally decided to stop his speech and language therapy and intensive services. Johnny stopped progressing. He was not receiving the special education services he was entitled to under the law, but no one was able to intervene and secure them for him. He fell further behind. When Johnny got to high school, it had been years since he had received appropriate services. Instead of providing the individualized instruction that he needed, Johnny's school gave him binders full of blank worksheets to complete by himself. Johnny hadn't made any progress in reading in over six years. When Johnny expressed interest in certain appropriate educational books, the teachers took them away from him. He was forced to read a mature book called "Monster" in which the main character-a young black male, like Johnny-deals with overwhelmingly complex issues of abuse, violence, race, and prejudice. In this environment, Johnny's grades and self-esteem plummeted. Then [Attorney Cary Brege] and Managing Attorney Lewis Pitts got involved. They investigated and found that teachers were not even following the individualized education plan they created for Johnny. They had disregarded recommendations given by their own psychologists and independent specialists. The environment was toxic for Johnny and his motivation was almost totally destroyed. Cary and Lewis filed a petition on behalf of Johnny, citing violations of federal law. They negotiated with the school district to have Johnny transferred to a new school for a fresh start for his senior year. Johnny is receiving individualized tutoring and speech-language services to help him catch up and graduate on time.